This article will explain what Email Forwarding is and show you how to set it up using your 123 Reg control panel. This can be very useful if you have a long or unmemorable email address at your ISP or work. You can then change this address to something more catchy, e.g. your.name@yourdomain.co.uk, and all mail sent to the second address will be routed to the first. Please note: You will not be able to send email from your forwarding address. What is the difference between email forwarding and a mailbox? Creating an Email Forwarding Rule is just like creating a signpost, and there is no physical storage associated with it. 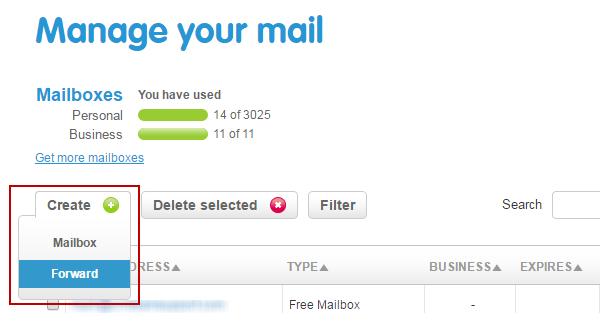 It is only used to direct your mail to an existing account like a Gmail, Yahoo or a Hotmail account for example. To be specific you could set up contact@your-123-reg-domain.com and have any mail sent to that address sent to yourname@3rd-party-email-address.com. However, although you can set up mail to be sent TO the forwarding address, you cannot send FROM the forwarding address. With one of our Mailboxes you can both send and receive at the new address. The mailboxes have full SPAM and Virus protection, 5GB of storage and we can help you set it up with Outlook, iPhone, Android or any other mail client of your choice. Or if you prefer, all mailboxes come with free Webmail access so you can access your email on the go from any computer. Scroll down the page until you reach the Email section. Click on the Manage email link. Click on the Create option then select the Forward option. Enter the email address prefix in the box provided, and select your chosen domain from the domains dropdown box. Then enter the addresses you wish your emails to be forwarded to. Then click either the Save and Exit or the Save and Add Another buttons. Please note: You cannot set up email forwarding on an email address if it is attached to a mailbox. Example: If you have a mailbox called my.name@mydomain.co.uk you cannot forward this email address to another email address i.e. myaddress@hotmail.com. To have an email addresses going to both a mailbox and an alternative email address, you would need to set up a "dummy" mailbox with a different email address i.e. 123my.name@mydomain.co.uk. You can then set up my.name@mydomain.co.uk to forward to 123my.name@mydomain.co.uk and myaddress@hotmail.com. How do I edit email forwarding? These instructions will show you how edit an email forwarded, enabling you to change the destination of your emails. For the Forwarder you want to update, select Forwarder Settings from the More menu.This will take you to your Email Forwarder’s settings page. From the Forwarder Settings page, click on the Edit link next to your forwarding address. 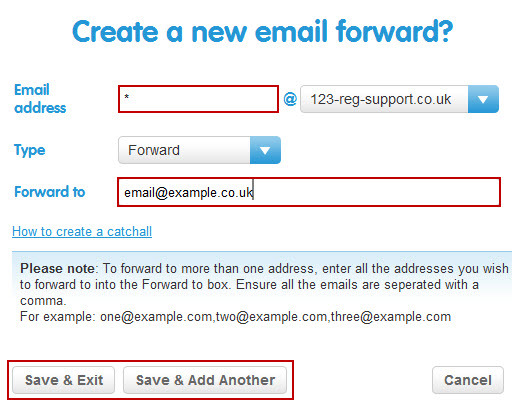 Now you can enter your new email address into the text box, and then click on the Save link to confirm your changes. How do I delete an email forward? These instructions will show you how remove an existing email forward, for when you want to add a new one, or just don’t need your existing one any more. Tick the box to select the forwarding rule you wish to remove and press the Delete selected button. Click on the Yes button to confirm the deletion. What is catch-all email forwarding and how do I set it up? Catch-all email forwarding is a great feature which comes with any 123 Reg domain name. It gives you the ability to forward all email sent to your domain on to an email address of your choice. To set up catch-all forwarding address for your domain name, you first need to log into your 123 Reg control panel, then follow the instructions below. Click on the Create your email addresses option. Click on the Forward option. Enter a * symbol into the email address box, and then enter the address you wish to forward your mail to in the Forward to box. Then click either the Save and Exit or the Save and Add Another button. 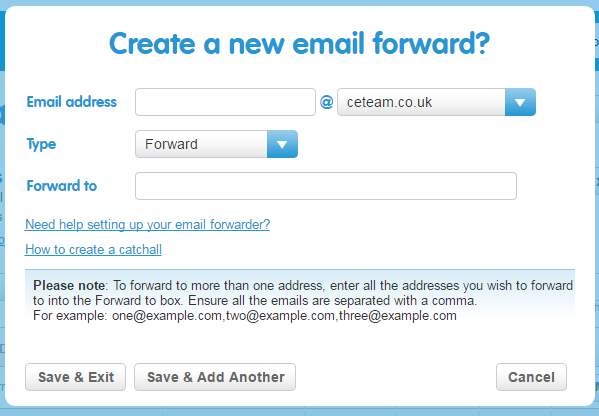 Your Catch All email forwarder will now be created.